NATURAL HABITAT AND PREFERRED SITE: Native to Asia but thrives in California and the southern states. Camphor tree does well from San Antonio south in Texas. Prefers deep healthy soil. Camphor tree has naturalized in southeast Texas. IDENTIFICATION INFORMATION: Camphor tree is a very beautiful, narrow, upright tree with shiny fragrant leaves that smell of camphor. FLOWERS AND FRUIT: Clusters of small fragrant white flowers in late spring followed by small black fruits. FOLIAGE: Leaves are ficus tree-like, shiny and have a drooping effect all the time but are very beautiful. The leaves are very fragrant and bright green. 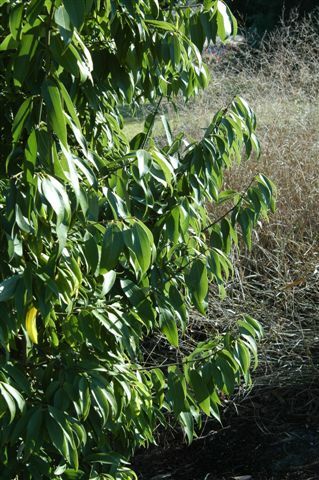 CULTURE: Camphor tree is easy to grow in the warm climates of Texas. When planted north of San Antonio it needs protection in winter and always needs excellent drainage. PROBLEMS: Freeze damage in northern two thirds of Texas. Roots are very competitive. Root rot is also a possibility but not nearly as much of a problem when grown under an organic program. PROPAGATION: Can be grown from seed or stem cuttings taken in the very late winter prior to bud break. INSIGHT: The wood is used in cabinetwork in the Orient. Camphor is produced by distilling the wood. Many of the camphor trees are multi-trunked and very interesting in the landscape. The issue at Winter Park City Hall currently involves camphor trees, an evergreen with plain looks and leaves that have a sharp odor similar to a cough drop or mothball. Although the large trees effectively calm noisy city streets, they are considered by scientists to be foreign invaders that are killing native landscapes, and some want them removed. The Tree Protection Board currently favors the opinions of tree huggers, which maintains the trees as a preferred species that cannot be cut down without a permit. Stephen Pategas, a landscape architect and Board member, believes that it is wrong to protect the exotic species of trees because they grow like weeds in Florida with little threat from disease or predators that may attack native trees. Winter Park is in the process of drawing up plans for the remaking of Mead Garden and at least some of the camphors are destined for removal. The future of Winter Park's camphors will be decided in 2007, when the City Commission holds public hearings on proposals for updating the tree ordinance. Pategas said he has counted 16 cities and counties from Alachua to Winter Springs that do not protect or encourage the removal of camphors. "I'm a firm believer in planting the right tree in the right place," said Pategas, who doesn't agree with cutting down all of the trees right away. "The camphor tree needs to slowly disappear from our landscape and be replaced with appropriate trees."